I don't blame you if after decluttering you still have lots of stuff in your closet. What I do recommend is to check out these tips the next time you are eyeing a new piece of clothing. A zero waste closet transition is actually easier that it sounds. It takes a bit of creativity and really the refusal to not be pulled into marketing gimmicks and cheap sales. What I would recommend as you start on your zero waste closet transition is to actually first UNSUBSCRIBE from all of those marketing emails you belong to. Keep a few brands that you absolutely love, but stay away from fast fashion emails. This can sometimes be the gateway to purchasing items you don't need. An email blast stating 50% of the entire Summer line is very tempting, but alas, you won't need those emails anymore. The fashion industry is a very wasteful industry. The resources it takes to produce cheap garments is unbelievable and many of us fall victim to weekly trends. We buy clothes that don't fit well, that itch, that fall apart quickly, that are so-so in quality all because it's on sale or a "great deal". All of this consumption results in waste. Last week's trend is already in the garbage even before we've had a chance to wear it. We have to be conscious of the toll this takes on our environment, on people and on our wallets. Check out Trust Cost Movie to see the impact fast fashion has. Remember that style and trend are not one and the same. 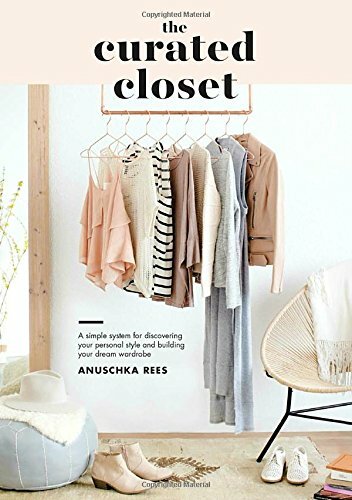 If you need some guidance on how to discover your personal style and build a dream wardrobe, I would recommend picking up The Curated Closet by Anushchka Rees in which she details how to find your style, how to pick your color palette and shop for clothes that last beyond just one season. Yes, you can still be stylish without having a large impact on the environment. Easier said than done especially when we've grown up with instant gratification. The true test of minimalism and zero waste is living and consuming consciously so many things you encounter that tug at your "I want" hear string may not be necessary at all. Doing without may actually prove that many of the things we would automatically buy are indeed unnecessary. So each time, you get that feeling of buying, walk away. Do without for a day, a week, a month and see if you miss out on anything. This requires practice so it's ok if you fall into temptation. Don't be too hard on yourself, but try harder next time. For me, when I initially though of secondhand, I thought used and cheap, but the more I researched and saw for myself the secondhand market of clothes, I was astonished to find how much quality and how much less the price was. There are also so many opportunities to buy secondhand, from thrift/vintage stores to eBay to ThredUp to Facebook, to Craigslist, to Instagram, the list is endless. Shopping second hand has allowed me to still enjoy the thrill of the hunt for that great piece, but it also means that I'm a bit more conscious of what I buy. The fit, fabric, cut and cost have to be great because I won't have a chance to return an item and I want to make sure what I buy is something that I can use for a while. I'm pretty lucky because I have 2 sisters and we are very similar in height and weight. Our styles are a little bit different, but that's ok because it means we have the opportunity to access a completely different closet. I've borrowed formal wear, casual summer wear from my sisters and it's a great opportunity to expand and share wardrobe. If you've got a best friend, why not do the same thing. Just make sure to take are of clothing borrowed and don't forget to reciprocate the favor. In fact, letting some of your prized clothing see the light of day is actually good clothing karma because what kind of nice dress wants to be stuck in a dark closet when all they want to do is shine and make you look and feel good. Don't forget services like Rent-the-Runway is also out there so you don't get stuck with that one dress you wore once to a wedding and never touched again. I never took home economics in high school, but now wish I did because then I would have learned to sew. How many of us throw out perfectly good clothing because it was missing a button or the hem was frayed? If we all could make little repairs to our clothing, we could keep them more and keep them out of landfills. Mending clothing is a great option to reducing clothing waste. It is also a chance to show appreciation to worn clothing by extending their life and taking care of them. Mending it can also be re-purposing or reusing clothing into something else. Like a t-shirt into a bag or a headband or a pair of old jeans into shorts. Start a relationship with your local tailor. Knowing them can make a difference to the overall fit of your wardrobe. When you are ready to spend, consider buying from companies that source, manufacture and market their products ethnically and sustainably. There are now many companies that have championed zero waste manufacturing or reusing and recycling old materials to make something new. This is a huge resource saver and something that we can all support. I follow Sustainably-Chic on Instagram to get the latest on what companies are worth paying attention to when it comes to sustainable fashion. You can also check out this list from The Good Trade. I'm sure there are plenty more doing this so do your research. I'm personally a fan of Everlane with their transparency and Patagonia for championing reuse and recycling of materials. When you do buy consciously, understand that it may cost a little more, but you are paying more for clothes to be made out of naturally sourced materials and handcrafted by people worth paying a few more dollars to. Remember that we still live in a circular economy. Purchases happen and perhaps you'll consider them mistakes, but be kind to yourself and work to consume better next time. Conscious consumption requires active participation. Our closets are one of the biggest culprits to waste so by enjoying our things more and taking care of them, we can reduce our impact and potentially save our wallets. Why I Send My Clothes To ThredUp?